New York City, NY- On Saturday, November 5, 2016, a Fundraising Gala was held in order to raise funds to restore and save Saint Sava Cathedral, which was devastated by fire on Easter Sunday, May 1, 2016. 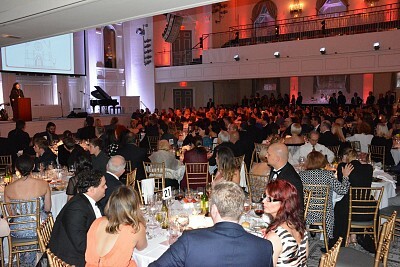 On Saturday, November 5, 2016, a Fundraising Gala was held in order to raise funds to restore and save Saint Sava Cathedral, which was devastated by fire on Easter Sunday, May 1, 2016. This Gala was also a welcoming event for the newly elected Bishop of the Serbian Orthodox Diocese of Eastern America, His Grace Irinej (Dobrijevic). The fact that the coordinators had to announce that the event was sold out and that the venue could not accommodate more than 340 guests is indicative of this evening’s great success. Among the guests present were representatives from the church, government, academic, business and sports circles, among many others, who came from Washington, DC, Boston, Cleveland, New York City and surrounding areas. Honored guests that were present during this evening were the newly elected Bishop of the Serbian Diocese of Eastern America, His Grace Bishop Irinej; His Royal Highness, Crown Prince Alexander of Serbia; His Beatitude Metropolitan Tikhon of Washington and All America and Canada (Primate, Orthodox Church in America); His Grace Bishop Sevastianos of Zela (Greek Orthodox Archdiocese of America); His Grace Bishop John of Worchester and New England (Antiochian Orthodox Christian Archdiocese of North America); Mr. Vlade Divac, famed NBA Star and Humanitarian; Dr. Zorka Milich, Chairperson, Restoration and Development Committee; Mrs. Rebecca MacDonald, Entrepreneur and Philanthropist; Very Rev. Dr. Zivojin Jakovljevic, Cathedral Dean; Very Rev. Vladislav Radujkovic, Cathedral Parish Priest; Mr. Nenad Milinkovic, President of the Cathedral Executive Board; and Canon Dr. J. Robert Wright, Episcopalian Diocese of New York. "I am very proud and honored to be given this place, this position and to be your father in God,” said His Grace Bishop Irinej. “I embrace you and say: You are the children whom God has given me, and I am the father who has been given to you. I pray that we may work together, to fulfill everyone’s dream and to rebuild this splendid Cathedral of Saint Sava so that everyone may know that the Serbians are here. They are present and they will never leave and they will never abandon this great gift which has been given to them,” continued Bishop Irinej. “I was so distraught when someone had the audacity to mention before me ‘your church is a ruin.’ ‘It is not a ruin,’ I said. ‘This is a living Cathedral, wounded, burned and charred, waiting like a phoenix to rise out of its ashes, and it will rise.” Quoting the writing of Saint Nicholai of Zhicha, relevant to our Cathedral rebuilding, who said, “Take the Truth, burn it until it becomes charred ember. Bury it six feet into the ground; walk away from it, do not abandon it, and look. You will perceive a new and magnificent plant, which will blossom from those charred embers.” “Our Church will not be destroyed. Our church will stand as it once stood. 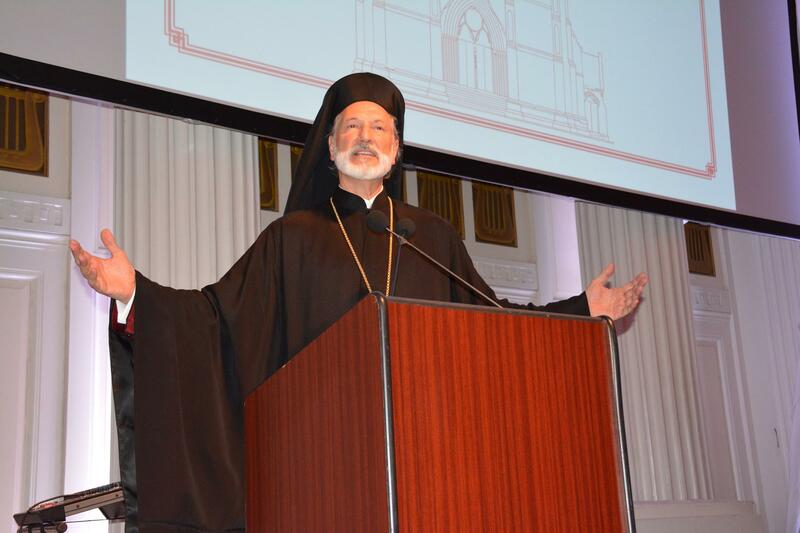 It will be a beacon to all of Orthodoxy,” Bishop Irinej said enthusiastically. His Grace ended his remarks by thanking our honored guests for gracing our event and praising their philanthropic efforts. He also thanked each and every one who came to support the rebuilding efforts. During the duration of the evening, a slide show displayed pictures of our beloved Cathedral, some recent, some more than seventy years old. Tears could not be hidden in the eyes of parishioners who deeply cherish this Cathedral and together suffer her loss, but who are determined and committed, under the leadership of His Grace Bishop Irinej, to rebuild it. The full photo gallery can be found here, on the St Sava Cathedral Facebook page.